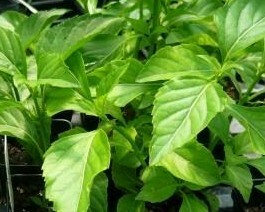 Green Pepper Basil (ocimum selloi) - Interesting and unusual basil variety from South America. Leathery and glossy green leaves look like those on a bell pepper plant. Leaves have a scent and flavor similar to green bell peppers too! Dries well and also retains it's color and flavor when frozen, microwaved, or cooked excessively. Excellent culinary variety useful in any dish where a bell pepper flavor is desired. Withstands cold better than many other basil varieties and can be overwintered indoors with plenty of light. Pretty spikes of maroon/pink flowers add interest to the herb garden. Perennial zones 9-11. Live starter plant in 3 inch container.